To call this simply the "Triple Timer" really doesn't do it justice. It's more like the "Swiss Army Knife" of timers! 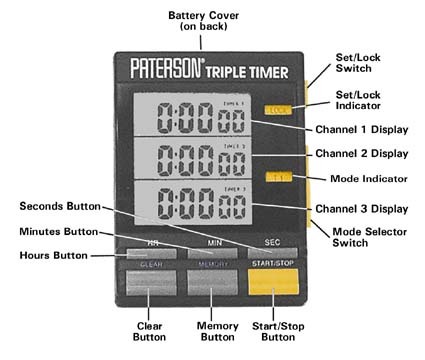 It has 3 timing channels, each of which can be set for hours, minutes, and seconds. The three channels can be set and run independently or concurrently. When the timer counts down to "0", there is an audible alarm, and the timer then continues to count up until you press the Stop" button so you are aware of how much extra time has elapsed beyond the original time set. Each channel has its own memory, so the previously set time can be instantly recalled. In addition, the timer has a clock funtion, with the option of 12 or 24 display. And a stopwatch function to 1/100 of a second. approx. 3½" x 2¾" x 1"
A very handy process timer for the darkroom, but can be used for other purposes as well. 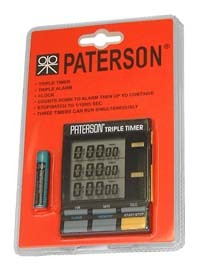 You might want to purchase more than one of these timers, as it may be difficult to keep it in the darkroom!